Sunday’s concert with Stefan Jackiw and the Boston Philharmonic under Ben Zander was a double pleasure: as I had never heard either this amazing violinist or this orchestra in my thirty-five years of living in Boston. What a fortuitous introduction to both this turned out to be! I also had never heard Sibelius’s “Lemminkäinen and the Maidens of the Island,” Op. 22, No. 1, from Four Legends from the Kalevala which opened the concert. Lemminkäinen’s story echoes the Finnish national epic, “The Kaleva,” a poetic epic compiled by in 1835 Elias Enrött, a country doctor, in 1835. I know the third movement of it, “The Swan of Tuonela,” well, by far the most famous of the four. Steven Ledbetter cleverly points out in his program notes that like other 19th-century heroes, Lemmenkainen lives in the key of E-flat, “…providing echoes of Beethoven’s Eroica Symphony and Wagner’s Siegfried at his most heroic.” Zander led a rousing performance of this rarely heard but really lovely piece. The French horns and English horn (Barbara LaFitte) were particularly excellent. I would love to hear Ms. LaFitte in “The Swan of Tuonela,” one of the high points of the English horn repertoire. 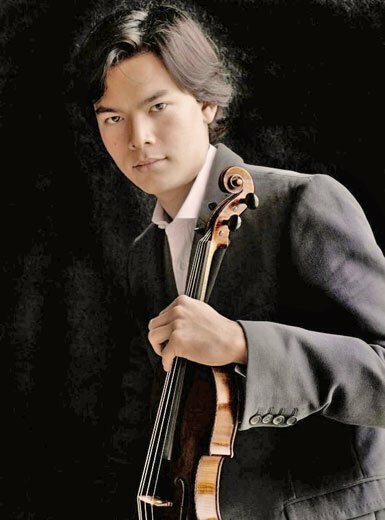 Stefan Jackiw, who at 27 already has a huge career, clearly means a great deal to Mr. Zander with whom he has frequently collaborated as soloist. No stranger to Boston audiences, Jackiw was born in Boston in 1985 to parents—both physicists—the father of German and mother of Korean descents. He was educated at Harvard and NEC and has won a enormous amount of praise and attention, as well as an Avery Fisher Career Grant (2002). Jackiw is a tremendously gifted player, one of the best violinists I’ve heard in many years. Yes, he’s that good. Prokofiev’s Second Violin Concerto, Op. 63 was an ideal vehicle for him, especially in the third movement with its agogic rhythms and jagged accents, and in the gorgeous slow movement where he sensitively spun out melodies. Quite slender and dressed simply in a black shirt and pants, Jackiw held the audience rapt from the first measures, scored for solo violin. It wasn’t just a fancy technique or the raw energy that impressed: most soloists have that. What Jackiw has is the kind of charismatic playing that draws you almost into a trance. Everything else melts away, even the rest of the orchestra. His playing grabs holds of you and you know without any PR machine that he is the real thing, a violinist against which all others one hears inevitably will be measured. Prokofiev’s delightful and inventive second violin concerto is played quite often, certainly much more than the first, with its diabolically difficult middle movement. Less irreverent and daring than earlier works by Prokofiev, it had its premiere in Madrid in 1935. The Spanish flavor of the third movement is reflected by use of its castanets, added to its dissonances, agogic rhythms (3/4, 4/4, 5/4 and 7/4), and jagged accents. I am convinced Raphael Popper-Keizer has a clone because no one cellist can play as many concerts in as many venues (The Boston Globe called him Boston’s busiest cellist). I see him in at least half the concerts I attend, and he is always very good. Here he played the role of Strauss’s gone-meshugah hero in Don Quixote, Fantastic Variations for Large Orchestra on a Theme of Knightly Character, Op/ 35 with the excellent violist Lisa Suslowitz taking the part of his sidekick, Sancho Panza. This is a tour de force for orchestra, which colorfully delineates familiar details of the knight’s adventure. The brass and the winds were outstanding. Ms. Suslowitz was terrific, as was Mr. Popper-Keizer, whose eloquent cello playing added a magical dimension to the Don’s adventures and delusions. A most impressive concert. My first live concert attendence this season on Thursday evening, and I blame BSO for this. Mr. Zander selected a far more interesting program, actually the most insteresting one in all his 4 concerts with BP. I am one of the FEW audience members who have listened to Sibelius great but underfamed work. Zander estimated single digit such observers to be on the scene. I thought the same way. Nonetheless, the swan of Tuonela is ‘usually’ played after the maiden of the island. I had the wrong impression that the entire suite would be performed before I sat down. I’d love to hear the emotion and tension in the 3rd piece. Jackiw’ prokofiev is very good. very good. R. Strauss always occupies a very high position in my heart, as he should. I was glad to hear Don Quixote live. But the orchestra’s sound was not beautiful enough. Well, everything has to be perfect for Strauss. FEWer conductors/orchestras (I use the same scale of numbers) could perform perfectly.